The frontiers of the Cape Colony were populated with powerful and strong Africa tribes and kingdoms. The agricultural settlers in the Cape Colony were fanning out eastwards along the southern coast. This direction had better quality soil and a climate more appropriate for western style crops and livestock. This particular area was populated by the powerful Xhosa. One small group of English settlers had actually leapfrogged along the coast and would form the nucleus of the Natal Colony. Governor D'Urban was also mindful of the unrest of Boers in the Cape Colony and their likely departure. He wanted to ensure that the better quality land would be available for British settlers and was not annexed by the Boers trying to leave British jurisdiction. He therefore annexed the land between the Keiskamma and the Keir Rivers and called it the Province of Queen Adelaide. However, London was not so pleased with this annexation and felt that it would lead to more unrest with African tribes rather than less. D'Urban was instructed to return the lands and sign a treaty to the effect. 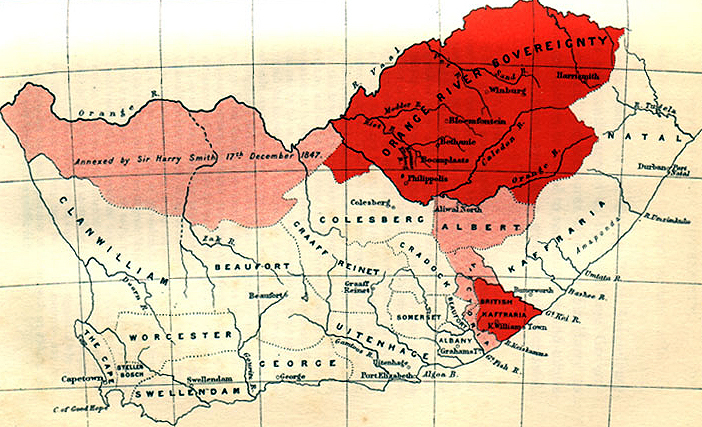 For the next decade, the Boers would bypass the area, they attempted to settle in Natalia but eventually were forced further north to the Orange Free State and the Transvaal instead. This was one less complication for the authorities to worry about. However, Kaffraria was being surrounded by more and more white settlers who were envious of the good quality land. 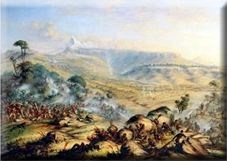 There were countless frontier clashes between settlers and Africans but the War of the Axe in 1846 would provide the excuse for a temporary annexation of Kaffraria. Unfortunately for the Cape expansionists, the timing was poor. In 1846 a Whig government came to power in London who were more sympathetic to African land rights and were less than impressed with the additional costs of administration. It therefore advocated the idea of a colonial administrative unit based on indirect rule. The chiefs would accept the Queen of Britain as their protector in the form of an attached British military commander. This system would establish imperial control with a simple form of government which would retain those tribal customs which would enhance the imperial authority. Best of all for the British, it was a very cheap form of government. The theory was better than the practice. When the first such commander arrived to take control military affairs he found that the frontier war was still fully raging. 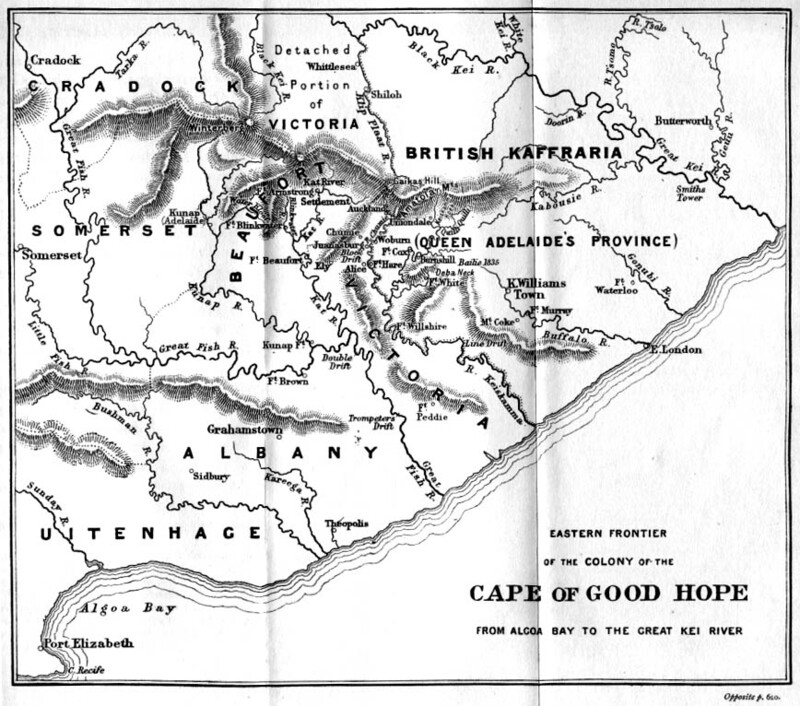 The Cape Governor, Sir Harry Smith, would take advantage of the confusion to annex the area to the Cape Colony instead. He clearly exceeded his original brief (which he would also do with regards to the Orange Free State) and was acting without the permission of the British Colonial Office. Missionaries were encouraged to go to the area and spread the word of god amongst the black population. The Church of England missionaries did indeed have a great deal of success. At the same time, white settlers were encouraged to settle in what was referred to as East Cape. It was originally hoped to entice retired English soldiers to settle the area so that a militia could be formed if yet another frontier war broke out. Few English soldiers applied for the subsidised land, but a number of German Legion soldiers were tempted. These would be supplemented by other Germans. The Xhosa realised that they had lost control of their destiny and attempted to force the British out of their lands through the deliberate destruction of all the cattle in the area (including their own). Xhosa regarded cattle as the ultimate form of wealth and it was thought that to destroy all the wealth of the area would encourage the Europeans to seek other lands. Unfortunately, this was not the case as the Europeans were able to import their own higher quality cattle (and sheep) from elsewhere in the Empire. However, it did demonstrate to London the depth of despair and hostility and it reminded them that their original plans had been ignored. In 1860, the colony was finally given its original protectorate status. Again though the timing was lousy. This time there was an economic recession that afflicted the entire Southern African region. 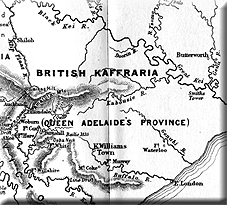 Unable to balance their books without support from the British Treasury, British Kaffraria was forced to look to the Cape Colony for help. In 1865, the territory was re-incorporated into the Colony where it would henceforward remain. Proclamation of the "Orange River Sovereignty"
An account by Harry Smith about the formation of the Orange River Sovereignty and British Kaffraria.